The Wood Duck is the most common nesting duck in Tennessee, and many consider it to be the most beautiful of North America’s waterfowl. It is found in forested wetlands, riparian habitats, and freshwater marshes. 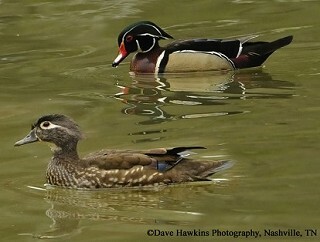 The Wood Duck is a cavity nester and where cavities are scarce, it readily accepts nest boxes. This species was nearly hunted to extinction by the early 1900s. With protection provided by the Migratory Bird Treaty Act of 1918, along with recovering populations of beavers creating wetland habitat and the widespread erection of artificial nest boxes, the species has recovered. The breeding range of the Wood Duck extends from southern Canada, throughout the eastern half of the United States, along the Pacific Coast and scattered locations inland. This duck winters in the southern three-quarters of the breeding range, and in the southwestern United States. Wood Ducks are uncommon to locally common across the state during the breeding season, with smaller numbers present in the winter. Description: The male Wood Duck has a brightly patterned iridescent-green and white head, with a long crest, a red bill and eye, a black back, a dark reddish chest, and pale golden sides. The female is overall gray-brown with a white patch around the eye, and a bushy crest on the head. From June-September the male is in “eclipse plumage” and resembles the female, but retains the head pattern and has a mostly red bill. In flight, both the male and female show a green patch (speculum) in the wing and a white belly. Voice: The upward-slurred flight-call of the female is distinctive. The male’s call is a high, thin, drawn-out jeweep. Breeding male Wood Ducks are unmistakable. Female Hooded Mergansers are similar to female Wood Ducks in shape and are found in similar habitats, but lack white around the eye, and have a white, not green, patch in the wing. Habitat: Lakes, streams and swamps with adjacent forest. Diet: Seeds, acorns, aquatic and terrestrial insects, other invertebrates. Nesting and reproduction: Wood Ducks nest in natural cavities, often in sycamore and beech trees, or abandoned Pileated Woodpecker holes, and readily accept nest boxes. In Tennessee, pairs start selecting nest sites in late February and may produce two broods in a year. Nest Box Instructions here. Clutch Size: Range from10 to15 eggs, with 12 eggs most frequent. Incubation: The female incubates for 28 to 37 days . Fledging: The young leave the nest within 2 days of hatching and stay with female. Nest: Wood Ducks prefer natural tree cavities, but readily accept artificial nest boxes when cavities are limited (See “For more information” below for nest box design). The cavity is lined with wood chips and down. Most cavities are over or near water but may be up to a mile from wetlands. 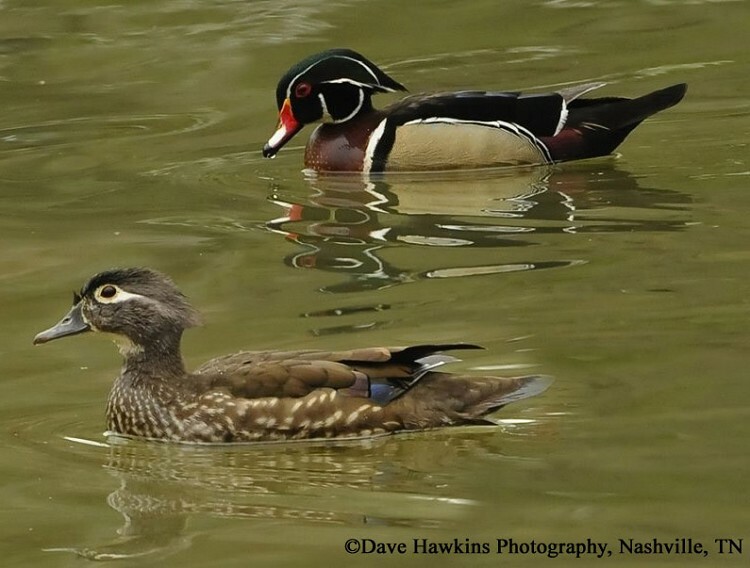 Status in Tennessee: The Wood Duck is a locally common breeding species and uncommon wintering duck across the state. After dramatic declines in the early 1900s, the Tennessee population has been increasing since the early 1960’s. This increase is the result of maturing woodlands across the state and an aggressive nest box programs on public and private lands promoted by TWRA. If nest boxes are placed too close together, several females may lay eggs in the nests of other females. These "dump" nests can have up to 40 eggs. After hatching, the female stands on the ground and calls to the young. The ducklings jump from the nest tree, from heights up to 290 feet without injury, and follow her to water. Best places to see in Tennessee: Forested wetlands across the state. Nest boxes are provided at most National Wildlife Refuges and TWRA Wildlife Management Areas with suitable habitat. Hepp, G. R., and F. C. Bellrose. 1995. Wood Duck (Aix sponsa). The Birds of North America, No. 169 (A. Poole and F. Gill, eds.). The Academy of Natural Sciences, Philadelphia, PA, and The American Ornithologists' Union, Washington, D.C.